SiriusXM Satellite Radio is something of a benchmark as far as satellite radio is concerned. More than 150 channels offer you seemingly endless variety of programming and subjects, from entertainment and sports to breaking news stories. SiriusXM Satellite Radio is commercial-free, and you can listen in-vehicle, online through a capable device or via the SiriusXM App. 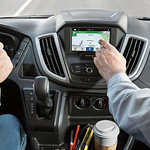 The FordPass App puts control of your Ford Transit Passenger Wagon in your hands. FordApp works independently or with Sync 3, Ford's infotainment management system. Using FordPass, you can start/stop your wagon, lock/unlock your wagon from anywhere, locate fuel by grade/brand/price, and access your wagon's service history directly from your phone. FordPass is best experienced up close and personally, so be sure to schedule your Ford Transit Passenger Wagon test drive at your earliest convenience.